Before I answer this question, let me say upfront that there are issues far more important, such as making sure you are targeting the right people, with the right message at the right time. The physical characteristics of your mail piece is only 10% of the formula to creating winning direct mail campaigns… your database (60%) and your message (30%) carry a grand total of 90% of your success. So we are playing in the 10% sandbox. But this question of postcards vs letters is indeed an important topic. Let’s explore further. Direct marketers are like chemists in a laboratory. They test everything. And test after test proves that when keeping all other variables the same (list, message, offer, colors, etc.) the letter will always outperform the self-mailer (postcard or folded card/flyer not in an envelope). The letter always wins. Why do letters always win? Most importantly they allow you to tell your story in a more compelling fashion than a postcard. Letters are like salespeople in an envelope and they can keep piling on the benefits and value of your offering. And letters have a higher perceived value to the recipient than a postcard. Letters are more serious. Letters are relationship builders. We did a test like this for a client where we mailed 5,000 postcards and 5,000 letters, both with virtually identical content with the exception that the letter told the story in more detail. The highly targeted list was split in half using an A/B strategy. End result: letter had a response rate 7x that of the postcard. Now, this is an extreme example, mind you, but it proves that letters always win. But letters in envelopes cost more. So it is really about determining which has the best ROI. After all, ROI is your true bottom line. Certainly every campaign is different, but we have found that postcards and other self-mailers get good ROI when planned well, but letters in envelopes have always had superior ROI… as much as $29 in revenue for every $1 spent for one of our clients. Here’s an important question. Are you launching a B2B or a B2C campaign? There are big differences between the two and this topic of letters vs. postcards plays a key role. In a B2B strategy where you are targeting executives at large companies, a postcard has a very high likelihood of getting quashed and never making it to your recipient. To reach these C-level executives in Fortune 1000 companies your mail piece needs to be able to jump through the hurdles of mail rooms, administrative assistants and other assorted gatekeepers to make it to your destination. This is why we almost always recommend letters when doing B2B campaigns, sometimes in creative packages (hand written envelopes, FedEx style envelopes, etc.) to ensure the mail piece makes it to the finish line. We launched a project for a B2B client where the envelopes are cloaked. There was no messaging other than the recipient’s name & address… and the sender’s address but not their name. It looks like a wedding invitation when it arrives. Humans are a curious lot and virtually every piece will be opened. And once it does, they have the perfect message for that recipient and the 60-30 part of the 60-30-10 rule will work brilliantly. This B2B client closed over 16 new customers with this strategy. In a B2C strategy postcards work very well. In fact, amongst our retail clients, the postcard is the dominant format that we create. One of our clients recently sent a postcard to 11,000 of their customers and carefully selected prospects and they received over $12 in revenue for every $1 they spent. Postcards can work great. And there are some specific B2B cases where postcards will work, especially if it is a small business where your decision maker is the one that picks up the mail or when it is a case where you already have a solid relationship and you simply want to make an announcement or present a promotion. 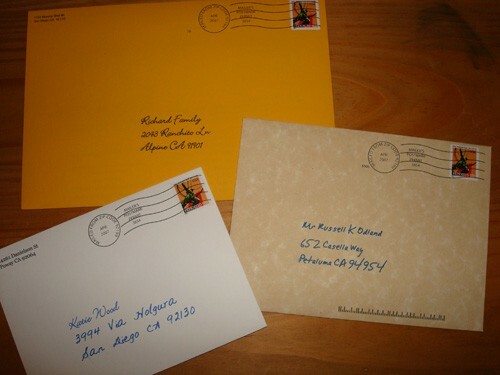 Letters in envelopes will almost always outpull postcards but they are more expensive to produce. Letters in envelopes should be strongly considered for B2B mailings. If you have a complex offering, then use a letter. A postcard will not give you enough real estate to tell your story and present all of the benefits. Ed McMahon and the Publishers Clearinghouse Sweepstakes understand this concept. Postcards are excellent for B2C mailings, especially when your offering is straight forward (window coverings sale) or where you have a previous relationship with the customer/prospect.